The GRF has an extensive collection of over 7000 pictures and photos relating to Gandhiji, covering all major activities and events during his life. This visual collection has been documented, compiled and converted into a mobile photo-exhibition named ‘Mohan to Mahatma’. The exhibition is displayed in schools and other educational institutions free of cost. 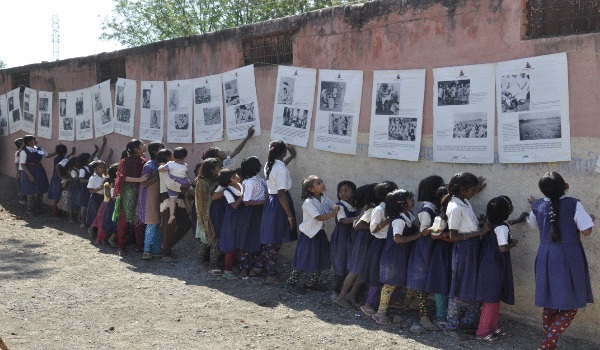 Until today, over 250,000 students in over 50 educational institutions have seen the exhibition, and hopefully, gained valuable insights into Gandhiji’s life and philosophy through this medium. The Foundation also designs and sets up exhibitions on various aspects of Gandhiji’s life for national and international organizations. The distinguished Gandhian and thinker, Narayanbhai Desai (1924-2015), the late son of Gandhiji’s long-time secretary, Mahadevbhai Desai, evolved a unique story-telling method to spread Gandhiji’s message to the masses. In the form of a ‘Gandhi Katha’ (‘The Life Story of Gandhiji’), Narayanbhai would present his narrative from a dais in an engaging, lyrical style. One such ‘Gandhi Katha’ was organized under the auspices of the GRF at Jalgaon with great acclaim. On the occasion of Mahatma Gandhi’s 150 birth anniversary, the Indian community in New Jersey (USA) is organizing a three-day international celebration under the banner ‘Gandhi Going Global’ in May 2019. The plenary sessions will be addressed by Michelle Obama, Sam Pitroda, Lord Bhikhu Parekh and eminent peace activists, scholars and thinkers. The US based social platform ‘Gandhian Society’ will anchor the event, in association with the Gandhi Research Foundation, the Gujarat Vidyapeeth and some other organizations. As part of the event, the Gandhi Research Foundation has designed and set up an elaborate exhibition entitled ‘The Path of the Fearless’. This is an exhibition in commemoration of the 150th birth anniversary of Mahatma Gandhi and his wife Kasturba Gandhi that offers the most inspiring and transformative concepts from the life of Mahatma Gandhi. The primary aim is to generate curiosity and interest among the young generation in the man who shunned the language of guns, even when faced by extreme provocation. He showed us that even the most brutal forces of the world can be successfully tamed using the weapon of nonviolence. The exhibition will present the manner in which Gandhi presented nonviolence and love as the ideal path, accessible to the brave. Gandhi had proclaimed that the ‘Brave are those armed with fearlessness, not with the sword’. This exhibition will help people to envisage, and hopefully to establish, a global family in a world without violence.